Before I started my job in 1998, I barely knew we Hindus bury our dead," says Arpan Shee. “Even today, when I go to the corporation office and introduce myself, people are genuinely surprised. ‘Hindu burial ground! Does that really exist?’ they ask." Shee, who is in his 60s, is employed by the Kolkata Municipal Corporation as a medical examiner at such burial grounds. His office is spartan. An old ceiling fan turns unpredictably as he sits on a one-armed chair, at a table strewn with red and green ledgers where the names of the dead are inventoried in blue on yellowed pages. A tiny window near his desk opens out on to a vast green landscape—the Topsia Hindu Burial Ground, one of the three such cemeteries in Kolkata. Long before Calcutta metamorphosed into Kolkata, Hindus were burying their dead here. The three burial grounds are located strategically in the east, the north and the south of the city. 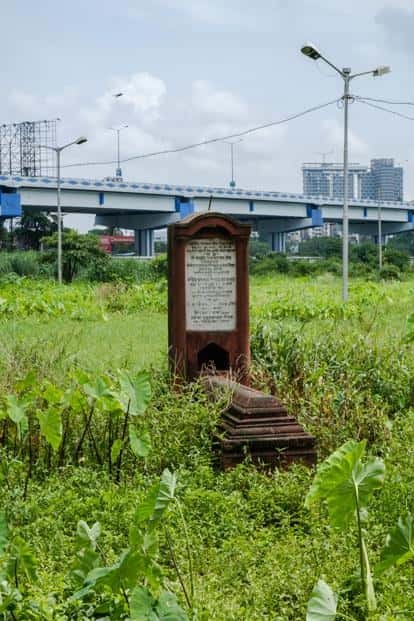 The Topsia Burial Ground is on JBS Haldane Avenue at the Topsia-Tangra crossroads, where the Bypass cuts through Kolkata’s ecological heritage, the East Kolkata Wetlands, and takes a right towards the busy Park Circus junction. The Muraripukur Burial Ground lies close to the bustling Bidhan Nagar Road Railway Station in Ultadanga. In stark contrast, the Bhatchala Burial Ground is sequestered off the Budge Budge Trunk Road on the southern outskirts of Taratala. Shee has done stints at all three, and thinks fondly of Bhatchala. “It is really like a graveyard. Sunsaan (desolate)." At Topsia, he is seeing out the sunset of his long career. In its early years, the Topsia Burial Ground, said to be established in the late 19th century, used to stretch much further infield, into what is now Tangra, the city’s second Chinatown. The arrival of the Eastern Metropolitan Bypass in 1982 confined the burial ground to a dense patch on the southern side of this arterial road. The Bypass has since become an uneasy border between the living and the dead. It is pouring this particular day. Wet and uncertain, we wade through an urban garden that is draped in rich monsoon green, speckled with large shady trees, and covered with a thick luminescent undergrowth, much of it dominated by the elephant-ear-shaped leaves of Colocasia esculenta, known globally as taro and locally as kochu. A wooden bedstead with a well-worn bedroll bunched up on one side is getting drenched under an acacia tree. The lush undergrowth that slithers up its legs teems with soft mud and quiet ghosts. A little ahead, a pond heron squats on a bed of water hyacinth that has colonized a wetland, while a cluster of dragonflies flutters overhead. In this theatre of the non-human, Nirsu Ram Majhi, a local labourer, is loading his rusty bicycle with outsized bales of durva (Bermuda grass), helencha (water cress) and kulekhara (Hygrophila spinosa)—edible and medicinal plants. Such are the gifts from the dead to the living—some of these, finding their way to religious rituals, will dissolve the boundaries between purity and pollution. In Hinduism, certain categories of corpses are not cremated, but immersed or buried. As Jonathan Parry notes in Death In Benaras (1994)—his study on the burning ghats of Varanasi—these include the ascetic, “who has performed his own mortuary rites at the time of initiation, is already dead to the social world and is said to remain on earth as a wandering ghost", and is buried sitting up; children, usually below 12—“a child is ineligible for cremation before it has teeth to masticate…recalling the textual injunction that an animal is unfit for sacrifice until it has cut its teeth"; lepers, who were historically not cremated for fear of “an infectious ‘gas’" escaping the body; Vaishnavites; and certain other sects and castes. “The child is buried so its parents don’t have to watch it burn," says Ramprasad Mullick, a gravedigger who was born and raised at the Topsia burial ground, while flicking off vestiges of the downpour clinging to his skin. A muscular man in his mid-50s, his eyes seem haunted. Everything he says sounds sad. His father was also a Dom, he says, a Hindu caste dwelling on the margins of society, one of weavers and basket-makers, blacksmiths and masons and, infamously, of gravediggers, cremators and executioners. We walk with Mullick, gingerly stepping through the wet grass. People are buried everywhere. In stark difference to Christian and Muslim graveyards, nothing is marked. “No masonry work allowed due to scarcity of lands," proclaims the Organs of the Municipal Corporation of 1987-88 (an official document that governs all municipal work in the city), except for “saints and other notable religious dignitaries". Mullick takes us to a fresh grave. It is small, a child’s. People have left behind little markers: bits of saffron cloth, some candle boxes, slippers, empty bottles of rose water, tinctures of medicine. “Sometimes they want to bury a child with something they loved to eat—like mishti (sweets), maybe luchi (deep-fried flatbread)," he says. “The death of a child is never normal. The pain cuts deep. It touches us too." In Shee’s ledgers, most of the records show burials of children, though adults also appear regularly. These adults are mostly from the Dalit, Vaishnav, Hela and Kabirpanthi communities. For Dalits, burying their dead has long been a way of resisting the crushing authority of Brahminical Hinduism. At times, burial is simply the cheaper option. The Kolkata Municipal Corporation, which is in charge of all burial grounds in the city, charges ₹ 50 for the burial of a child under 12, and ₹ 100 for others—less than half of what is charged at the electric crematoria. “It’s a little more for Marwaris and Vaishnavites. They bury the body with a lot of salt. It helps melt the flesh off the bones," Mullick says. The number of Bengali Hindu adults being buried has steadily decreased over the years, but Shee recalls an incident when a retired, upper caste, Central government employee in his 70s came to Topsia with his grandson, scouting for a site for his own burial. “He’d been to Muraripukur and Bhatchala, but he liked Topsia the best," Shee says. “But we don’t reserve burial sites!" he quickly adds. The Muraripukur Hindu Burial Ground—at around 3 acres, the smallest of the three sites—is tucked away at the back of Ramakanta Sen Lane, shielded from the cacophonous thoroughfares of North Kolkata. Right outside is the quaintly-named Lily Biscuit Factory—maker of a product once part of middle-class Kolkata, now shuttered forever. A disproportionate number of tea stalls and breakfast holes line the cemetery’s red walls, residues of a bygone industrial era. The burial ground was probably established sometime in the late 19th century, as a place for burying the bodies of infants. Over time, it has expanded to include both the young and the old. Shee’s counterpart in Muraripukur, Sunil Kumar Maiti, is another career custodian of Hindu burial grounds in the city. Stationed in a terracotta red office with the white-collar reticence that is a hallmark of government officials in the state, his anxiety filters through a veneer of polite composure. Used mostly to talking with bereaved families, his interaction with us is uneasy—a tension that is settled only after we have had our first cup of tea. Maiti is aware that sadhus and sanyasis must be buried, and that the practice is also prevalent among Dalit communities from Bihar and Uttar Pradesh who have made Kolkata their home, particularly the Rauts and the Helas. Incurious to such goings-on, he has only once asked a family why they were burying their “upper" caste relative instead of cremating him—it was the dying man’s last wish, he was told. We are taken for a walk around the site by Asharfi Dom, a septuagenarian gravedigger who was born at this burial ground and has raised his family here. He carries with him the silence of his workplace. “We have two sizes," he murmurs when we ask him about burial practices, “adult size and child size". Usually, it takes two diggers 2 hours of working together to dig an adult’s grave. And ascetics, cross-legged for eternity? “We dig round holes for them, and deep. After we’ve put them in that posture, of course. A few bones have to be cracked, obviously." The narrow concrete path that cuts through the burial ground is tiled with shadows thrown by trees planted on both sides— togor (crape jasmine), kadam (burflower), jarul (pride of India), krishnachura (gulmohar), chhatim (devil tree). This tranquil urban garden is occasionally disrupted by the cackle of babblers, the sweet-sharp calls of red vented bulbuls, and the sudden arrival of a family of Indian grey mongooses, which stops fleetingly to look at us before darting into a purple thicket of fringed spiderflowers, thereby dislodging a kaleidoscope of grey pansy butterflies. A black-hooded oriole settles on the branch of a chhatim tree nearby. Called benebou (merchant’s wife) in folk stories, it is a symbol of resurrection—an ill-fated woman, abused at her husband’s home, her sari stained with turmeric from cooking and her head smeared with kitchen soot, commits suicide, and is then resurrected as a black-hooded oriole. These graveyards are places for the dead, but they are not dead places. “Those are mahogany trees," a young gardener at Muraripukur points out. “Good wood. They make rifle butts out of mahogany." Dressed in a T-shirt that says “Science—always happy to be proven wrong", he speaks to us on condition of anonymity. In his other life he is an artist and has exhibited recently at the prestigious Kochi Biennale—rubbing shoulders with artists and celebrities from across the world (most of the younger staff at burial grounds are educated and eloquent, their decision to work here made for them by their caste and lack of opportunity). It is a casual aside, this comment on gunstocks, but it brings us closer to the entanglement of these burial grounds with Kolkata’s long history of political violence. And to find our ghosts, we must go back to the Calcutta of the 1970s, those days of Naxalbari and rage. Back then, the unclaimed dead used to be buried in any one of the three burial grounds. This continued till 1998, when an electric crematorium for unclaimed bodies was built on the eastern fringes of the city, in the Dhapa Dumping Area. “Unclaimed bodies"—a bureaucratic term that attempts to wash politics off the dead—were brought to the burial grounds in large municipal corporation vans at all hours for burial. But one of the old timers at one of the grounds remembers a more subterranean narrative, involving police vans in the dead of night, and unidentified bodies of young men and women. Police vans? we ask. Not municipal vans? “Police vans. Sometimes. They would tumble out. I remember. We would have to dig the graves quickly." When exactly was this? “1970s…maybe early 1970s? Maybe mid-1970s? I forget." The burial of newborns also—sometimes—goes beyond narratives of personal loss. The sishubodol controversy in the 1990s— where staff were bribed to switch newborns at hospitals—led to frequent requests for exhumation, and gravediggers had to dig out the decomposed remains and then re-bury them. They did not have masks, gloves or boots—just bare hands and feet, and a handkerchief wrapped around their face. These burial grounds may be fine and private places for the dead, but the living are often deeply inconvenienced. The staff quarters at Topsia have no running water, and the workers here—gravediggers, caretakers, guards, gardeners— have to make do with water for cooking, drinking and bathing from a tanker that comes in the morning. Every monsoon brings flooded entrances and muddied ground floors. “Morar kono nirdishto somoy nei (There’s no designated time to die)," Ramprasad Mullick mutters under his breath. Every day, round the clock, the caretakers work tirelessly to provide a final resting place to bereaved parents, the poor and so-called “lower caste" Hindus of the city. In Kolkata, these burial grounds are outposts of friction against authoritarian Brahminism and what Kipling called the Big Calcutta Stink. For many who are buried here, there is no room in our socially sanctified crematoria. The burial grounds are a far cry from the chaos and clamour of ash and furnace that assault you at the city’s crematoria. Comforting in their anonymity, they burst with biodiversity and demarcate patches of wild botanic calm in one of the most densely populated cities in the world.